Sinclair Lewis Remembered is a collection of reminiscences and memoirs by contemporaries, friends, and associates of Lewis that offers a revealing and intimate portrait of this complex and significant Nobel Prize–winning American writer. After a troubled career as a student at Yale, Sinclair Lewis turned to literature as his livelihood, publishing numerous works of popular fiction that went unnoticed by critics. With the 1920s, however, came Main Street, Lewis’s first critical success, which was soon followed by Babbitt, Arrowsmith, Elmer Gantry, and Dodsworth—five of the most influential social novels in the history of American letters, all written within one decade. Nevertheless, Lewis’s Nobel Prize for Literature in 1930 led to controversy. Writers such as Theodore Dreiser, William Faulkner, and Thomas Mann expressed their dissent with the decision. Unable to match his previous success, Lewis suffered from alcoholism, alienated colleagues, and embraced unpopular political positions. The nadir for Lewis’s literary reputation was Mark Schorer’s 1961 biography, Sinclair Lewis: An American Life, which helped to legitimize the dismissal of Lewis’s entire body of work. Recent scholarly research has seen a resurgence of interest in Lewis and his writings. 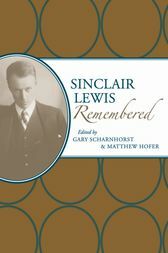 The multiple and varied perspectives found in Sinclair Lewis Remembered, edited by Gary Scharnhorst and Matthew Hofer, illustrate uncompromised glimpses of a complicated writer who should not be forgotten. The more than 115 contributions to this volume include reminiscences by Upton Sinclair, Edna Ferber, Alfred Harcourt, Samuel Putnam, H. L. Mencken, John Hersey, Hallie Flanagan, and many others. Gary Scharnhorst is Distinguished Professor Emeritus of English at the University of New Mexico. He is the author or editor of more than thirty books and editor of the journal American Literary Realism. Matthew Hofer is an associate professor of English at the University of New Mexico. He coedited, with Gary Scharnhorst, Oscar Wilde in America and has published essays in Modernism/ Modernity, Contemporary Literature, New German Critique, and American Literary Scholarship.